A gang war erupts in Hell’s Kitchen after Boomerang picks a fight with the Shocker, sending a message from the Owl. Receiving this message loud and clear, Kingpin takes to the streets to settle this dispute personally, further escalating the danger. Jessica Jones leads a S.H.I.E.L.D. response team to get the streets back under control. Spec Op 31 features Jessica Jones and Boomerang. Bio – The same accident that left Jessica Jones in a coma and killed her parents was also responsible for giving her amazing strength. Shortly after deciding to become a hero, she became a victim of the Purple Man's mind control. Jessica eventually broke free from his control, but remained traumatized by the long term experience. 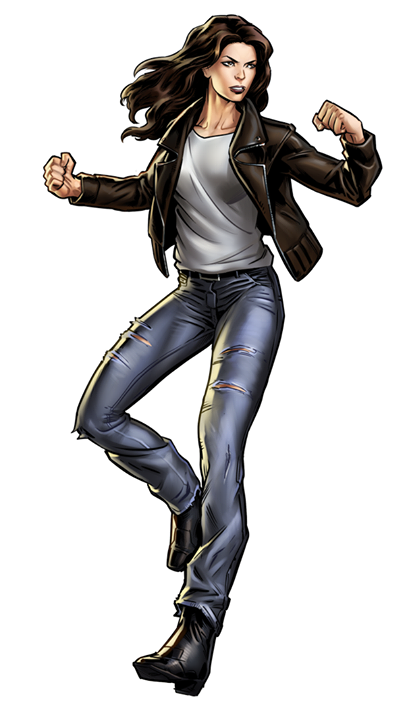 With her hero days behind her, Jessica opened Alias Investigations and became a private detective, working with locals like Matt Murdock, Luke Cage and Heroes for Hire. Jessica and Luke eventually turned a fling into a thing, and ended up married with a daughter. Jessica has recently been kept busy helping Luke lead various teams like the Mighty Avengers. Bio - Fred Myers loved baseball, but not enough to stop accepting bribes. Recruited by a criminal organization that outfitted him with the deadly boomerangs he came to be known by, Fred became a mercenary for hire. Commonly seen as a joke, Fred fought for his villainous peers' approval, but usually ends up falling flat on his face. Still, it's hard to find good help, and Fred found opportunities to earn a living. Hearing of S.H.I.E.L.D. 's incredible benefits from Constrictor and Taskmaster, Fred decided it was worth a shot to put his skills to use against his peers instead of trying to earn their approval. They'll see just how good he is when his boomerangs whack them across the head. Wilson Fisk's rise from the streets of Hell's Kitchen was a result of his strong ambition and strategic mind than just his incredible skull-crushing strength. His ruthless efforts became infamous, earning him the title as the Kingpin of crime. Janice Lincoln was given a suit of beetle armor by Baron Zemo and Fixer. She eventually found herself working with Boomerang until he had a change of heart and now sells her skills to the highest bidder. Herman Schultz was just a career criminal until he built his own battle suit that could generate shockwaves. He defeated a weakened Spider-Man in their first encounter, gaining increasing notoriety.